In the first two months of 2015, at least seven transgender women of color — almost one a week — were murdered in the United States, from Miami to Los Angeles. 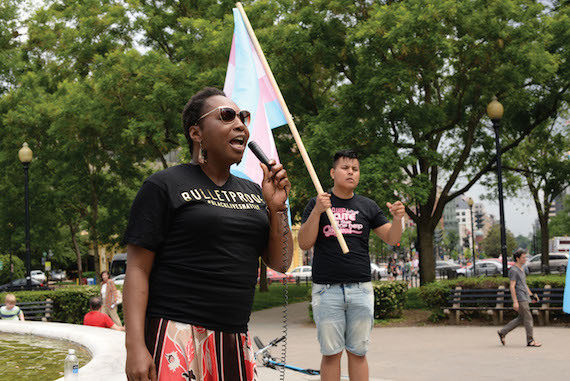 Since 2013, according to the National Center for Transgender Equality (NCTE), nearly 30 transgender women, most of them black and Latino, have been slain with fists, knives, guns and hate. The territory is filled with peril. On Jan. 4, two white transgender women — Rae Raucci, 52, and Samantha Hulsey, 24 — were riding a city bus in San Francisco at 5 p.m. after a day of shopping. They were sitting in the back, talking about the rest of the evening when a man across the aisle began accusing them, Raucci says, “of defrauding him by pretending to be women.” As he got louder and more menacing, the women hurried off the bus at the next stop. The man followed, pulled a 3½-inch steak knife from his coat and stabbed Hulsey in the chest. She ran into a fast food restaurant for help while Raucci tried to distract him until police could arrive. Bleeding, Hulsey returned to the street to help her friend and the man stabbed Hulsey again. She survived and the man was arrested and charged with attempted murder and a hate crime. Between 0.3% and 0.5% of Americans — nearly 1 million people — identify as transgender, according to a recent report, Understanding Issues Facing Transgender Americans, written by the Movement Advancement Project (MAP), the Transgender Law Center (TLC), NCTE and GLAAD (formerly the Gay & Lesbian Alliance Against Defamation). Another widely cited study, from the Williams Institute of the University of California, Los Angeles, estimated the number at about 700,000 Americans. When Tracy was in her 20s, trying to save up enough money to have gender reassignment surgery — so her inner and outer self could finally match — a stalker shot her in the back and in the legs on a Chicago street.